This is a great way to use your leftover pulled pork or roasted chicken. The BBQ Sauce from Kogi BBQ was created by Chef Roy to be strong flavored enough to match the smokiness of BBQ’d pork or roasted chicken. 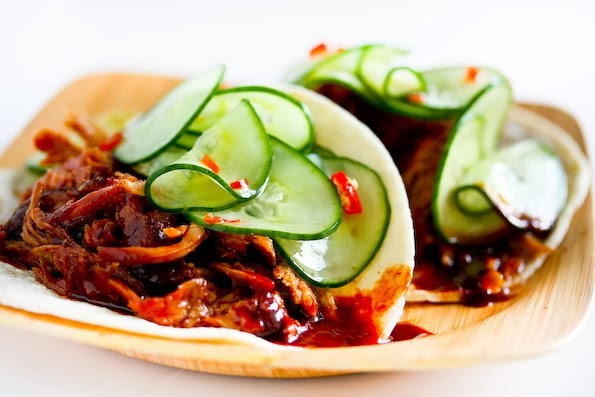 You can add use kimchi (spicy pickled Korean cabbage) to top the tacos, or make a quick cucumber pickle like I have. The recipe for the quick cucumber pickle is below. Whisk all ingredients together until sugar has dissolved and mixture is smooth. You can make this a few days in advance and store tightly covered in the refrigerator. I like using English cucumbers or Japanese cucumbers – the skin is thinner and they have fewer seeds. If you have a Mandoline Slicer it certainly will make the job much easier. Mix together all ingredients. You can make this a few hours in advance and store in the refrigerator -- however, the longer it sits, the less “crunch” you’ll have. I like making this cucumber pickle 1 hour prior, storing in the refrigerator and serving it cold on the tacos for texture and temperature contrast. Enjoy and here is some cooking muzak!